These Chocolate Covered Strawberry Cupcakes are made with a moist chocolate cupcake, fresh strawberry frosting and delicious chocolate covered strawberries. Perfect for an occasion, like Valentine’s Day! I can’t believe that I’m already talking about Valentine’s Day. It feels like I’ve barely moved on from Christmas and New Year’s. But alas, it’s just around the corner and I’m here to help with a fun and tasty treat. These cupcakes are like having two delicious treats in one! Between the chocolate covered strawberries and the cupcakes themselves, I’m not sure which I’m most excited about. I’ve always been a big fan of strawberries, so it comes as no surprise to me that the chocolate covered strawberries barely made it onto the tops of the cupcakes. I intentionally made extras but between the hubs and I, we could’ve eaten them all. And when you add them to the top of these cupcakes, they really are the perfect treat. I don’t make chocolate covered strawberries at home often, but after making these, I definitely need to. Not hard at all to make and quite quick. Not to mention that they are much less expensive than buying them already made. 1. To make the chocolate covered strawberries, place the dark chocolate melting wafers into a small bowl and melt according to package instructions. 2. Dip each strawberry into the chocolate, shaking off the excess chocolate, then place on parchment paper to dry. 3. Place the white chocolate melting wafers into a small bowl and melt according to package instructions. 4. Add some pink or red gel icing color and stir to combine. Add a small amount at a time until you have your desired shade of pink. 5. 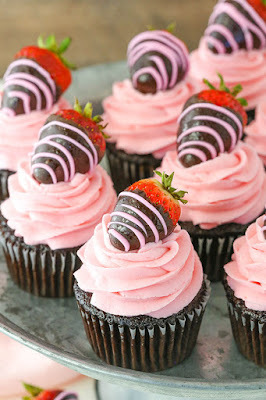 Drizzle the pink chocolate over the chocolate covered strawberries and allow to dry. Refrigerate strawberries until ready to use. 6. To make the cupcakes, preheat oven to 300°F (148°C) and prepare a cupcake pan with liners. 7. Add the dry ingredients to a large bowl and whisk together. Set aside. 8. Combine the egg, milk, vegetable oil and vanilla in another medium sized bowl. 9. Add the wet ingredients to the dry ingredients and mix until well combined. 10. Add the water to the batter and mix until well combined. Batter will be thin. 11. Fill the cupcake liners about half way and bake for 18-23 minutes, or until a toothpick comes out with a few moist crumbs. 12. Remove the cupcakes from oven and allow to cool for 2 minutes, then remove to a cooling rack to finish cooling. 13. To make the frosting, add the chopped strawberries to a food processor and puree until smooth. Strain the strawberry puree through a fine mesh sieve. Set puree aside. 14. Beat the butter and shortening together in a large mixer bowl until well combined and smooth. 15. Add about half of the powdered sugar and mix until well combined and smooth. 17. Add the remaining powdered sugar and mix until smooth. 18. Add the remaining strawberry puree as needed to get the right consistency of frosting and flavor. 19. Add pink or red gel icing color until you have your desired shade of pink frosting. 20. Pipe the frosting onto the cupcakes. I used Ateco tip 844. 0 Response to "CHOCOLATE COVERED STRAWBERRY CUPCAKES"